1) Find every thrift store near you. Visit frequently: I have a theory that almost every bit of current retail will end up in a thrift store somewhere six months to a year later. I'm serious -- I'll hold out on purchasing a blouse from Ann Taylor and see it in the Salvation Army months later. With that in mind, I very rarely shop retail stores and thrift most of my clothing purchases -- and my closet is a mix of vintage and modern (vintage is usually classified as being 25 years or older). I spend the majority of my time dress shopping at thrift stores such as the Salvation Army and Goodwill. I only have a few vintage stores in my town, and they mostly feature accessories, so the thrift stores are the best bet in my area. But since there are several Goodwills in my county, sometimes I will spend a day off going to a few just to explore the variety. Sometimes I strike out and find nothing, and sometimes I get really lucky and find lots of dresses. 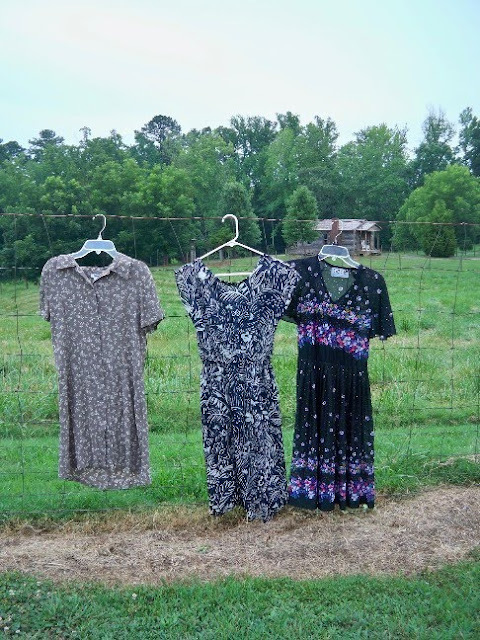 No thrift store is the same -- one store that features only dud items could vastly differ from the one that's 10 miles away that's stocked with a treasure trove of dresses. So map out your area if you can. 2) Find out about special sale days: As if their low prices weren't enough, some thrift stores offer special sale days, where certain colored tags mean those clothing items are half off. My Goodwill and Salvation Army both do this, and the Salvation Army also features a "Half Off Day" on Wednesdays, where all clothing is half off. Find out if your thrift stores do this, and go early on those days. In my town, those are the days the stores get raided by early bird collectors. 4) Know a tailor, and memorize the rates: I'm not an expert sewer -- I'm somewhere between being able to fix buttons but unable to alter lengths. So, it's very important for me to think about possible alterations when I consider purchasing a dress. A $3 dress might end up costing $25 after its broken zipper is fixed, which is still a low price, but alterations can really add up, so you should be picky about which alterations to do. My motto is that if a dress needs more than three fixes, put it back on the rack. 5) Google is your friend: One of my favorite things to do when I'm thrifting is looking at the tags. There are a lot of older and (sometimes defunct) clothing companies that still have dresses floating around in the thrift stratosphere, so it's fun to look at tags and wonder what happened to the companies that made the clothes. I'm not an expert on vintage companies, so anytime I find a dress I like, I always Google the company to figure out what era the dress is from. I hope these are helpful on your next thrifting adventure. What do you keep in mind when you're thrifting for dresses? Hey JoAnn! What perfect tips! I go thrifting often, too, and your tips are part of my routine. I really agree with being patient! The thrift stores near me squeeze tons of clothing on the racks. Even though it's time consuming to check every single one, you can find a great treasure! I also look through racks one size down and one size up from my regular size due to irregularity in vintage sizing. Thanks for the post! Great tips! I like how you really break down the cost of tailoring in terms of what the tipping point is from going to a thrifty garment to something a little more costly. Thanks, Joann! These are great tips, and I agree with every one of them. I totally Google labels too! For me the ability to sew opens up a whole lot of room for me with thrifting. If you can sew you can totally re-imagine a piece even if you just love the pattern. Up here there are a lot of new second hand and refashion places offering sewing classes. Even a few basic classes might help you to become more comfortable. thanks for the tips! love your blog! glad I found it. Supercute! Great little tips, thanks for sharing!